Our bird feeder has been very busy this winter. Chickadees are still our most frequent visitors, but our flock has diversified quite a bit. I spent some time hanging out the dining room window with my camera, trying to get some (not very good) pictures of our birds. It turned out that I was just in time for the Great Backyard Bird Count. The count happens over four days every February, and the goal is to collect data on wild birds to get an idea of where and how many birds there are. Woodpecker. 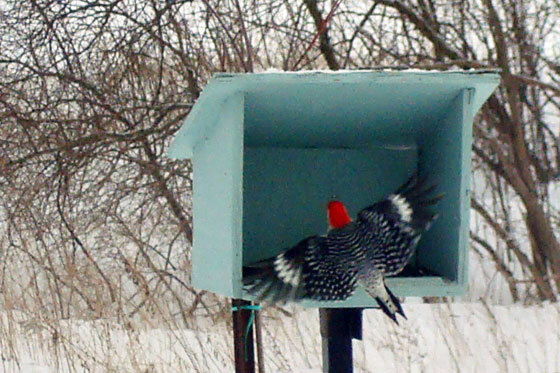 I think this is a red-bellied woodpecker, but we also have a pure black and white one that visits every so often. For some reason, there’s an understanding among the birds that the feeder is a one bird at a time operation. 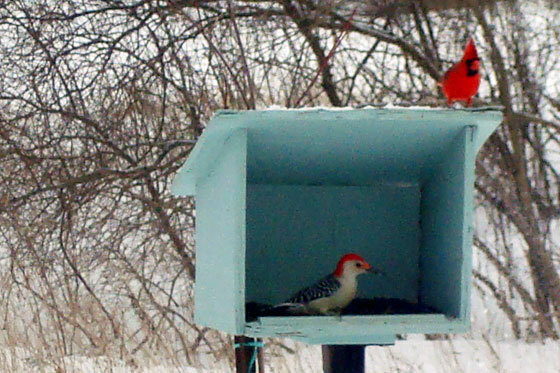 The woodpecker is our most skittish bird, but he swooped in while the cardinal was still in the feeder. 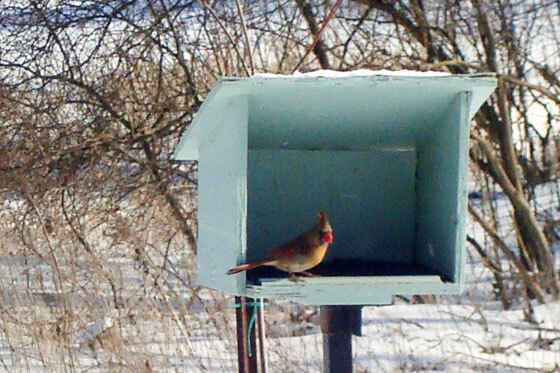 I swear I heard the cardinal hiss at woodie as he hopped to the roof of the feeder. 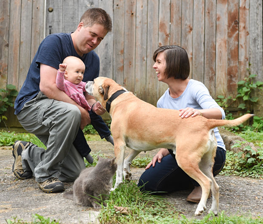 Do you have a bird feeder at your house? Who are the members of your flock? Anyone know whether I’m correct in my identification of the junco and woodpecker? Here are the plans to build our simple bird feeder. I’ll bet that the birds around our house are staging a protest! I have not been feeding them. I know, I feel so bad writing that. Your pictures are perfect. It was like they posed just for your camera. 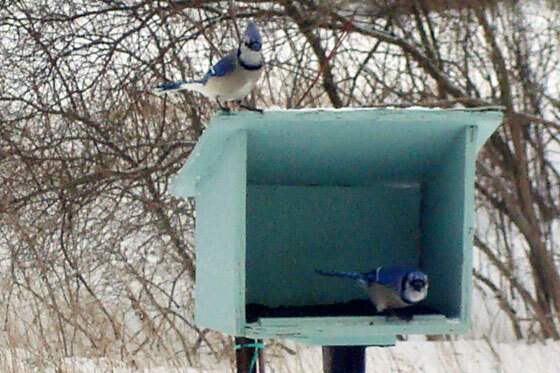 And those BlueJays are stunning! All right, I feel bad, I am going to fill our feeder when I get off work today. You have to fill the feeder! 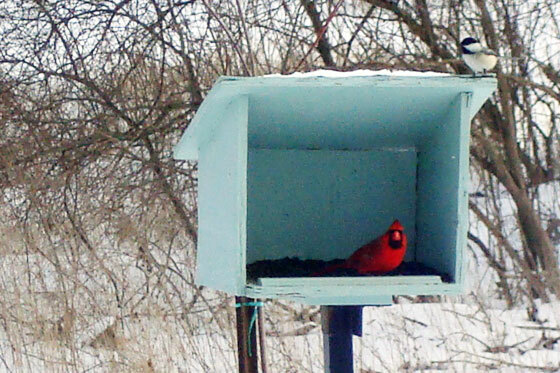 It’s been so cold and snowy here that the birds have been emptying the feeder every day. We used to be able to go two days before we had to fill it! yup! 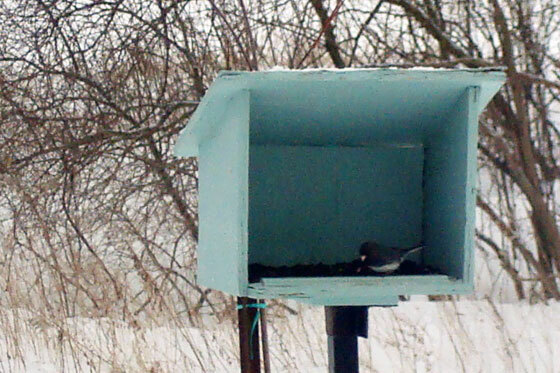 100% Junco-if you see a large group flying past you see only white-amazing. Bill. Thanks for the confirmation. I should have known you’d know for sure. Lovely birds, lovely photos! So funny that they use the feeder one at a time. The male cardinal is stunning! I remember you asking for a cardinal photo!